You must make reservations at least 5 minutes in advance of the time at Lark Mezzanine. Parking is available at metered spots on nearby streets, as well as at local pay lots. The most convenient garage is located on Broadway between the Silver Cloud Hotel and The Garage billiard hall. Lark can create a special menu for a event of any size, from a small gathering of twenty people to a party of more than 100. Please give us a call at (206) 323-5275, we'd love to discuss the details with you. Welcome to the mezzanine of Lark, one of the Pacific Northwest’s premier, artisan-focused restaurants. We have two dining rooms which offer different ambiance but the same menu. Our mezzanine is spacious with a rustic, elemental decor, tucked up into the rafters of our historic building. Lark's ground floor dining room is classically elegant, featuring white linen tablecloths and plush banquettes. Please check both this page and the Lark Open Table page to see the full selection of tables offered on a specific evening. Give us a call at 206-323-5275 if you're having trouble finding a table, our hosts are happy to help. Parties of 6 or more will be seated at 6:00 pm or 8:30 pm, please call to make those reservations. **We are now offering Short Rib Suppers on the mezzanine every Sunday and Monday evening. One generous 'Dino Bone' short rib served with crispy potatoes, grilled broccolini & lemon horseradish gremolata, plus a bottle of hearty red wine for $30 per plate. Chef's choice oysters $1.50 and cocktails $5. When dining out, always look for the relationship between the quality of the food and the price. The food was decent, but not anything you would do cart wheels over and did not live up to the high price. The wait stall and restaurant were great. Generally pleased. I knew about the corkage fee but was disappointed to be charged $60 for 2 bottles of wine despite spending $600 on dinner and cocktails. Comping one of the corkage fees would have been a class act. Great food . Lovely ambiance. Good service. We had the 49 dollar prie fixe meal. Best duck I’ve ever had and grapefruit sorbet was amazing. I Heard great reviews and wanted to try the restaurant but The service was really slow. We had to wait at-least 15 mins for every course. The servers were really great though but I felt no one paid attention to the guests. Even hen we arrived there was no one to even seat us. Awesome roast dinner. Definitely worth the price we paid. Would surely come again. I was pretty disappointed in the value. The food was good...? It wasn't great. The service was very good, but still disappointed in the experience. There are many restaurants in the same price point in Seattle that have much better food. Innovative and well prepared food. Excellent and knowledgeable server. Bar needed two bartenders given how busy they were. It was my first time there and it certainly exceeded my expectations!! Delicious food. My first time there.would definitely go again. Great place and nice service, but most importantly, the food was not great... meats were overcooked and the timing of foods were not measured at all. Four partners and friends with their spouses shared a celebratory dinner at Lark. The cocktails, appetizers, main courses, desserts, and wine were enjoyed by all and the service was excellent. My hamachi crudo, beet salad, and osso bucco were delicious. The Lark Fashioned and Pinot Noir complimented the meal well. We will return soon. The short rib dinner was fabulous! And it was a great value. My partner and I met friends for dinner and we all ordered the short rib special. The meat fell off the bone it was so tender. The broccolini and fingerling potatoes were cooked perfectly. All of us had plenty to eat and raved about the food. Lark itself has a wonderful setting, warm and elegant. The experience was lovely and I would have given them 5 stars across the board if the service had not been so slow. But the wait staff was awesome - the kitchen was just overwhelmed. And they were very accommodating to us and our parties needs. Overall a fabulous experience. Wonderful experience. It was our first visit for the special rib dinner. Amazing! We will be back. Awesome food, warm and cozy ambiance (mezzanine). We had the short rib supper, which came with a bottle of wine. Great food and very filling for 2 people. Wine was OK (got a headache from it, but it tasted good). Amazing value for dining out in Seattle! Went with a friend for our monthly dinner. Food and drinks were good. We started with the burrata which was very good but I wish it would have been served with Italian or French bread. Gerhard had the venison with Brussels sprouts, Yorkshire pudding and a glass of red wine. I had the pork belly with the Harvey Trading Co cocktail (kind of a mix between an Old Fashioned and a Manhattan). Venison was great. I thought the pork belly a little too rich but Gerhard liked the garlic-y flavor. I forget what was served with the pork - mushrooms, I think. We split a cake dessert which I preferred more than Gerhard. Service was great. Overall, the dinner was fine; nothing at all was disappointing but nothing was so fantastic that I absolutely have to go back, especially because the meals are on the pricey side - total cost with 20% tip was $175. I would recommend Lark to a friend. We sat in the Mezzanine but I wish we would have sat downstairs. It seemed more intimate. It is conveniently located - right behind the iHOP on Cap Hill. Pretty good food, but it was 15 minutes between each service contact. Greeting and water service, then 15 minutes waiting. Drinks served and 15 minutes waiting. Starters served and then 15 minutes waiting. Entrees served and then 15 minutes later, dessert orders. It was the slowest and least attentive service I have ever experienced in Seattle. Nice people. Understaffed maybe (which means incompetent)? Super slow service. I've been to Lark twice before, always enjoyed a meal there. This time it went off the rails. We were two couples; asked the server how many different cheeses to order for four, she said about three would be right. $6 each, and we ordered crackers for a few more bucks. Ok, we aren't Denny's patrons, we've all been to lots of Seattle small plate restaurants, but when the tiny plate with the three teenie pieces of cheese arrived, and the cup with about 4 pieces of cracker, we were all stunned. A serving fit for a mouse. It was awkward to share that little food. The Mussels were delicious, served with a lot of delicious creamy broth, but just two small pieces of toasted bread to dip. How do you share those little pieces of bread? Then the next 15 minutes, we tried to get the waitress's attention to get more toast, and spoons (none on the table to enjoy the broth). Up on the mezzanine, she spends most of her time going up and down stairs to the apparently distant kitchen, too busy to even check on us. When we finally got her attention and asked for more toast for the (now cold) mussels, no, that's not an option but I can bring an order of bread, and then she dashed away before we could ask for spoons. SO frustrating. The bread was good, but not suitable for the broth. 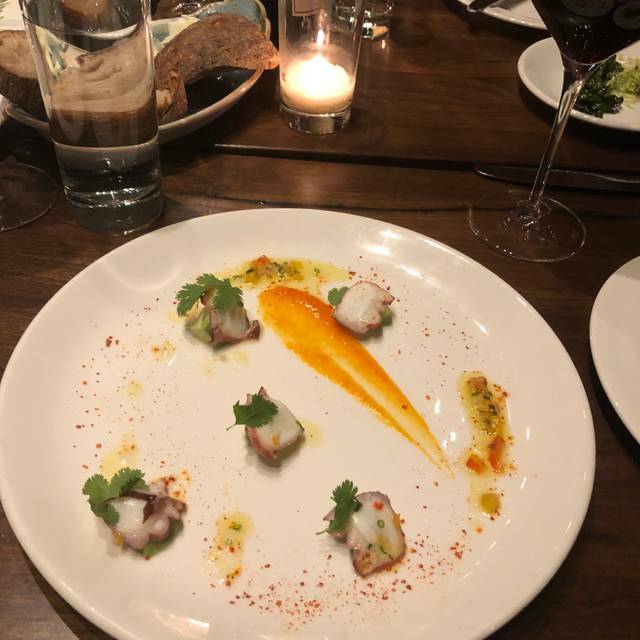 It was an odd experience: every bit of the food was good, excellent in fact, but some of the serving sizes were terribly ill-conceived, and the service was poor on the mezzanine. Great meal, service, conversation, and company. Had the short rib/wine special and it was fantastic! We had a delicious dinner, the Rib special which included a bottle of wine up stairs in the Mezzanine and it was delightful. A dealtoo good to last. really really overpriced. Was almost $400 for 2 to eat not that much and have a glass of wine. Loved it. Short rib dinner was perfect for a cold, wintry night. We also tried two of the desserts, and they were excellent. Sunday Short Rib supper was great! That's pretty much what I wanted to say, but this app requires typing at least 50 characters... so there, I've done it! This is a fantastic restaurant. We have been going there for years to celebrate all big occasions in our lives. We try almost all the small plates when we go there for dinner. Always consistent, always great. And we love Kelly, the co-owner. They have great customer service. We went for our anniversary and unfortunately were not impressed. The food was okay, but nothing we couldn’t have made at home. A wonderful dining experience. Food was terrific, very professional service, and wonderful mood lighting. Will return. Gotta save our pennies first, it ain’t cheap. lark is great , needs a sommelier transplant. Awesome service, delightful food, excellent wine list! Go there...you absolutely will not regret it. Vanessa was a delight as our waitress. Definitely would come back here again. Food tasted great. This place is incredible, it is a must for any romantic date nights, and the cool thing is you can bring your own wine bottle. Me and my girlfriend had an amazing time, service was great and super fast, the waitress was super friendly and helpful with choices and the foods were outstanding. I’m definitely going back and would absolutely recommend this place to anyone that is looking for a spacious fancy nice restaurant for an incredible romantic date. Lark was beautiful. The staff was extremely friendly and helpful. We made reservations for New Year’s Eve since we had heard great things. The special menu they made for NYE offered an array of options and the server was resourceful in helping us understand the menu and offered some great wine pairings. She even asked us if we had any dietary restrictions which is very accommodating. The meal was delicious and the courses were well thought out. The highlight for me was the meyer lemon parfait which was a great way to top off the meal. It’s a great place for special occasions or if you’re feeling that extra bit romantic. As always, the food and service excellent! Thanks again for a wonderful night! My husband and I went on a date night and it was fabulous! The server was great, food was amazing and the place is very cool. I'd highly recommend it!